Did you know that one in three adolescents in the United States will be a victim of physical, sexual, emotional or verbal abuse? 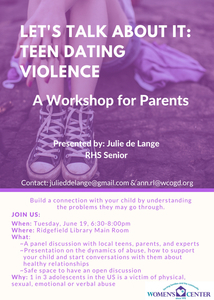 The Women's Center of Greater Danbury is hosting a workshop for parents, Let's Talk About It: Teen Dating Violence, on Tuesday, June 19, from 6:30 pm to 8 pm at the Ridgefield Library. Ridgefield High School senior, Julie de Lange, will be presenting on the dynamics of abuse, support for adolescents, and healthy conversation starters on this difficult topic. After the presentation, there will be a panel discussion of local teens, parents and experts.